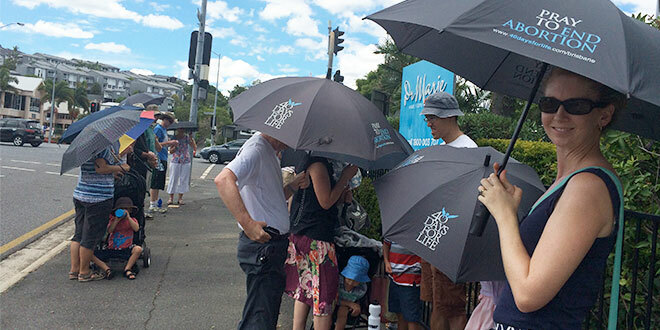 MORE pro-life advocates are choosing to give up an hour or more a week to pray outside Australia’s largest abortion provider as their Lenten fast. 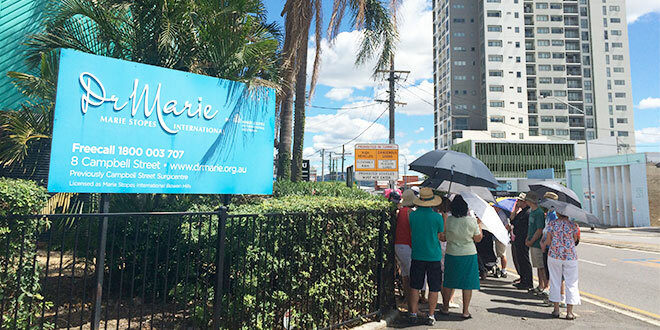 For nine years Brisbane Catholic parents Brendan and Judy Wong have co-ordinated 40 Days for Life, a campaign that invites people to pray non-stop outside the Marie Stopes abortion clinic in Bowen Hills during Lent. At the halfway point of this year’s 40-day vigil, organisers held a rally, which included the group’s first Mass since starting in 2008, and scheduled prayer at the abortion clinic. Mr Wong said the numbers at their Midpoint Rally were at their highest in years, with at least 30 turning up to pray on the day. “At its peak there was a good and surprising number of people turning up, plus it was the first time we had a Mass so that contributed to the numbers,” Mr Wong said. He believes a video message denouncing the legalisation of abortion in Queensland from their patron Brisbane Archbishop Mark Coleridge was also creating “a flow-on effect” in the pro-life movement. “I think we can see a start of flow-on effect following Archbishop Coleridge’s videos with the Pyne bills being defeated,” Mr Wong said. For more than 12 months, State Member for Cairns Rob Pyne attempted to decriminalise abortion in Queensland with two independent member’s bills but he withdrew both one day before they were due to be debated in Parliament. The withdrawal of the two bills is good news for 40 Days for Life participants, who could have faced up to three years’ imprisonment if they had passed. In one of Mr Pyne’s two abortion bills, the Cairns MP called for exclusion zones of 50m around abortion clinics, and if the laws had passed, would have made it a criminal offence to protest “by any means” in protected areas. Mr Wong said one of the key aims of 40 Days for Life was “to be a visible presence” outside the Marie Stopes clinic. He said the group’s presence showed that abortion was not just a trivial issue. Lenten fast: 40 Days for Life Brisbane organises an all-night prayer vigil for 40 days in Lent. Photo: Mary Grace. “Everyone on the pro-choice side would love to not think about abortion and the damage it causes in women and society,” Mr Wong said. “By being visible and loving and prayerful, we present the option for people to bring up abortion in a healthy and respectable way. Mr Wong said the presence outside Marie Stopes was needed more than ever after hearing about two Sydney-based rugby league football players who allegedly forced their ex-girlfriends into having abortions to protect their careers. A young woman claimed Penrith Panthers player Bryce Cartwright and a rugby league “fixer” paid her $50,000 to have an abortion, while Jaya Taki, former girlfriend of de-registered West Tigers player Tim Simona, revealed to Nine News last week that she was “guilted” into having an abortion or “you will ruin my life”. “And this is what got me really angry, is because I had an abortion on the Friday and on Saturday night he’s out clubbing,” Ms Taki told Nine News. Mr Wong said over the years he had heard “plenty of stories” about women being coerced by their partners to procure an abortion, but pressure from society and financial anxieties were also contributors. “This definitely shows that there is a lack of support and awareness of the options that are available,” he said. Mr Wong said there were several available timeslots between now and Palm Sunday for people considering taking up a last-minute Lenten fast. “We need to remind people that this is an option for a Lenten sacrifice,” he said.